Dryden Vos (Paul Bettany) with just one of the many pieces in his impressive Star Wars collection. The importance of the link between Star Wars and its merchandise really can’t be overstated. Star Wars basically created movie merchandising, and it’s one of the things that’s kept Star Wars alive for decades. And while most may think Steve Sansweet at Rancho Obi-Wan has the biggest and best Star Wars collection out there, we think Solo: A Star Wars Story’s Dryden Vos may have him beat. Now, sure, Dryden isn’t around any more to show off his collection. He was killed by his lieutenant Qi’ra. It’s also not real, since it’s from a movie. But what we did see of Dryden’s collection in Solo: A Star Wars Story was impressive. Most impressive. And, in the new episode of The Star Wars Show, we got a few confirmations of even more items in his collection. Here’s the video but just in case you can’t watch, we put together a quick rundown of what’s revealed down below. So, for example, Dryden Vos owns the Dancing Goddess. The Dancing Goddess from Dryden Vos’ collection. The Dancing Goddess is a deep cut EU reference from the original ‘80s Marvel Comics series. It was a powerful artifact that changed hands multiple times, from Prince Xizor to Lando Calrissian (who has his own mementos). However, with that all removed from the canon, the statue can now only be attributed to one owner, Crimson Dawn gangster Dryden Vos. Vos also owns Xim’s Death Head. Not a crystal skull from Indiana Jones. The head is from the EU, specifically the cover of the novel Han Solo and the Lost Legacy by Brian Daley (which we reported on a few weeks ago). In that story, the Death Head is part of an ancient treasure Han and Chewie try to recover. There’s also some “ancient Mandalorian armor” in Vos’ office (which you can get another look at in the image at the top of this article). Mandalorian armor is the coolest. It’s pretty self-explanatory, though it’s always nice to see a new piece of Mandalorian armor in a live-action Star Wars movie. We’ve seen holocrons many times before (they’re basically ancient Star Wars hard-drives), but they are always of the utmost importance, have special abilities, or contain crucial information. 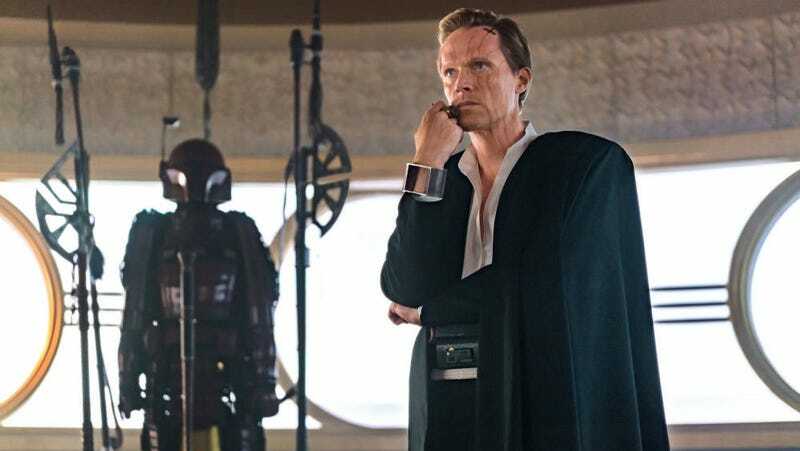 Since we know Dryden’s boss is none other than Maul, and Maul has been known to go after a holocron or two, maybe this has a connection to him? Even if that was the plan, though, it’s doubtful we’ll ever know how Vos got this holocron, what’s on it, or why it’s so big compared to others we’ve seen (unless the comics or books decide to expand on it specifically)—but it’s cool nonetheless. Oddly, The Star Wars Show segment does not mention the Idol from Raiders of the Lost Ark that’s in there, or the dozens of other interesting little things laying around, some of which are in the Solo official guide book. But, it all adds up to the absolute fact that Dryden Vos is a king, not just of gangsters, but of Star Wars collectors as well.